A Patronymic last name ends with -son or -sen and was coined as last name from a patronymic. A patronymic name (pater=father, latin) is a name constructed from the father’s given name. In Norse custom patronyms and matronyms were formed by using the ending -son (later -søn and -sen in Danish and Norwegian) to indicate “son of”, and -dóttir (Icelandic -dóttir, Swedish and Norwegian -dotter, Danish and Norwegian -datter) for “daughter of”. This name was used as a descriptive name for most Scandinavians. Sometimes also a third name based on location or personal characteristic was added to differentiate people. Families would then adopt a name, either a patronymic in recent use, a farm name (Norway) or place name from the family history, a soldier name (Sweden) or other to be their hereditary last name. A patronymic chosen as family name is called a frozen patronymic. The -sen versions are mainly Danish or Norwegian, the -son versions are Swedish, Norwegian – or British! What about Finland and Iceland? Finland is one of the Nordic countries together with the Scandinavian countries, but it is not part of Scandinavia, and has a very different language as well as a naming tradition. In parts of Finland (Savo) hereditary surnames have been used for many centuries, in the rest of Finland patronymic names and farm names were the custom. In Iceland the patronymic names are still used, and people do not have hereditary surnames. The British patronymic surnames are essentially different, as they were coined much much earlier, and function as real surnames with a patrilinear inheritance (like the Y-chromosome). Norse and Anglo-Saxon/Old English culture and (Germanic) languages were very similar and closely related. The Normans also came from the same Nordic culture even if they had adopted the Old French (Roman) language. The Anglo-Normans were among the first in the world to start using hereditary surnames based on patrilines, to keep record of families and relations as well as property and tax. The naming practice of patronymic surnames come from the same culture as the Scandinavian practice, but in Britain this happened with the introduction of surnames between 1100 and 1400. Make sure you find out whether it is a Scandinavian name from after 1800, or an old British name coined before 1500. This will tell you which DNA projects are relevant for you. Spelling variants with -sson, -son, -sen are treated as one name. These are all of Scandinavian origin (Norwegian, Swedish or Danish) and were first registered used as last name between 1800 and 1923. They can not be used for Y-DNA genealogy or surname projects. Following the direct paternal lines of these names will always go back to a man whose first name was Ole, Lars, Karl etc. The projects are mainly useful to get help tracing your name’s origin so you can join the more useful geographical projects and research the paternal lines further. These are of British origin, English or Scottish, and were first used as last names from about 1100. They are highly useful for Y-DNA genealogy and surname projects. If your direct paternal line (Y-DNA) is of British origin and has one of these names, please join the appropriate projects. In Wales Patronymic names were used as late as 1813 in some districts: See the Welsh Patronymics DNA Project. What does it matter that my Patronymic Last Name is “new”? Then you see how essentially different British Patronymic Surnames (coined 1100-1400) are from Scandinavian Frozen Patronymic Last Names (coined 1800-1900). Since Y-DNA and surname based genealogy is about finding the most distant common ancestor in a direct paternal line, 4-6 generations is not enough. Read more about which DNA projects are useful. There are many other cultures than the British and Scandinavians that use or have used patronymic names. For each of these, you need to study how far back the history of the name goes in your own lines, in order to review whether it can be used for DNA genealogy or whether it was coined too recently. Mark Jobling and the research team at Leicester has published several articles and research papers on the correlation between surnames and Y-DNA, all relying on surnames that are old and inherited strictly through direct paternal lines. 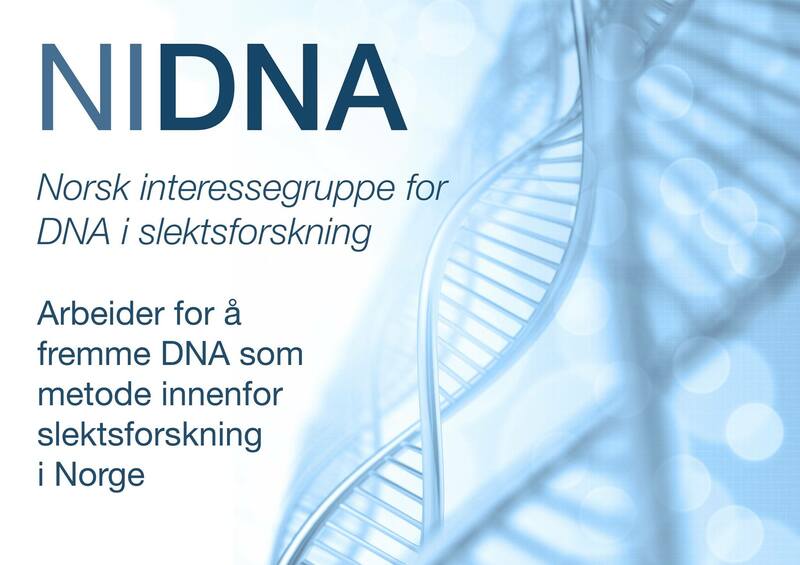 Norsk Slektshistorisk Forening (NSF) – The Norwegian Genealogical Association – has a list of old Surnames from families in Scandinavia, and a few of these are -sen form. Some of them have old Danish origin (usually Schleswig-Holstein, southern Jutland) and can be used for DNA genealogy, while most of them are first registered after 1700.